Drink local through Dorchester on Saturday, December 16th. We’ve put together an awesome lineup of local spots to celebrate the holidays! With your ticket, you get a punch card for 1 Dorchester-made beer (12oz) at each of the following stops below, along with a limited edition Dorchester glass. A portion of the proceeds will be donated to College Bound Dorchester and Greater Ashmont Main Street’s campaign for Revitalizing Peabody Square. At the end of the beer crawl ending up at Dorchester Brewing Company, you can redeem your punch card for your exclusive commemorative glassware and also be entered into raffles to win local Gift Cards and Swag! 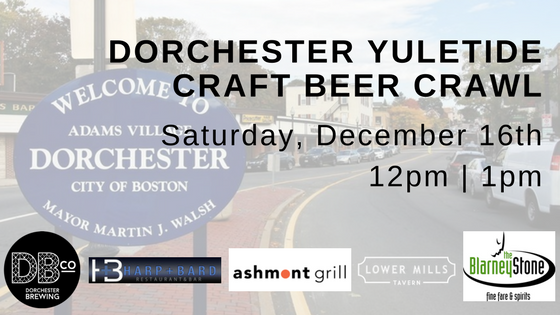 Finish the beer crawl with Dorchester Brewing Company’s Big Holiday Bash taking place all day at the brewery with live music, donuts and food from Ashmont Grill!